Please find below the National Foal Pictorial. Thankyou to Michael Procter for collating the pictorial this year. It is fantastic to see how many people sent photos in for the pictorial. 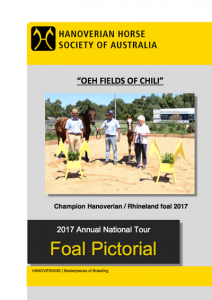 The top ten foals have been selected by our classifiers and they are shown in the pictorial. This year not all gold ribbon foals made the top ten, an indication of the quality presented to our classifiers. Well done breeders!! The Society runs on volunteers who give up much of their free time to make the Hanoverian World in Australia go round.